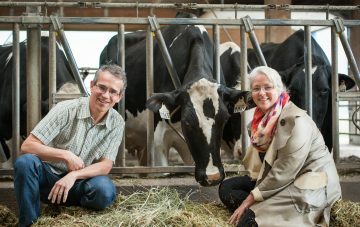 Professors Marina von Keyserlingk and Daniel Weary, from the Animal Welfare Program in the Faculty of Land and Food Systems, have been awarded membership into the Journal of Dairy Science (JDS) Club 100. Since the first issue in 1917, the JDS has become the leading dairy research journal in the world. The journal listed roughly 49,800 authors on accepted papers in the last 16 years alone. The editorial board created the Club 100 as a way to honour the most productive authors who have authored or co-authored 100 or more papers in the journal. Von Keyserlingk and Weary are among only 18 initial inductees into the club. They were recognized for their achievement at the 2017 American Dairy Science Association Awards Banquet held in Pittsburgh in June. For more information, see this news release.